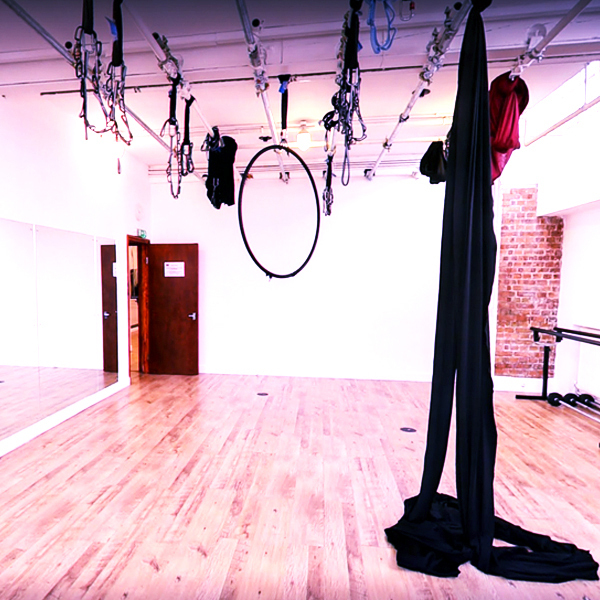 Aerial Hire: Rent an aerial hoop, aerial silk, rope, trapeze, or aerial yoga hammock, or pole to practice on for 1 hour at the Old Street studio 1. There are 5 hoops, 4 silks, two ropes and one trapeze, 6 poles (Lupit Poles chrome 42mm spin or static) to choose from. Cost includes equipment (one person per aerial hoop/aerial silk/trapeze/pole). For all hires, we also have a range of conditioning and stretching equipment available at no extra cost. This includes: ballet bars, crash mats, yoga mats and blocks, TheraBands, kettlebells (8, 10 & 12kg), hand weights (1-5kg) and weight bars (10 & 15kg), all waiting for you to train with. Please note this is a self-practice session without a teacher. By purchasing this option, you agree to the disclaimer at the bottom of your receipt. This includes being responsible for your training and being able to work on the apparatus of your choice without guidance. Please note that rigging set up should not be changed under any circumstances. Reception will help you rig / derig your equipment of choice. You can book directly from the timetable for aerial and pole hire sessions. For exclusive use of any of the studios, please email bookings@londondanceacademy.co.uk or call us on 0203 490 1018.